I had a hard time deciding on a pecan recipe to make this week. At first, I was thinking of making pecan butter tarts, but then changed my mind and made pecan cake. However, my frosting did not turn out at all so that’s why I’m not including the recipe here today. It tasted good, but looked terrible. 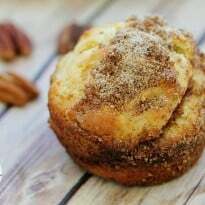 Then I figured I’d make some Pecan Coffee Cake Muffins since it’s not as easy to screw these up! Thankfully, they turned out beautifully. I might have given up on making a recipe this week for pecans since I wasn’t having much luck! Did you know there is a National Pecan day coming up? In fact, there’s two dates that celebrates pecans: March 25th and April 14th. Not sure why! 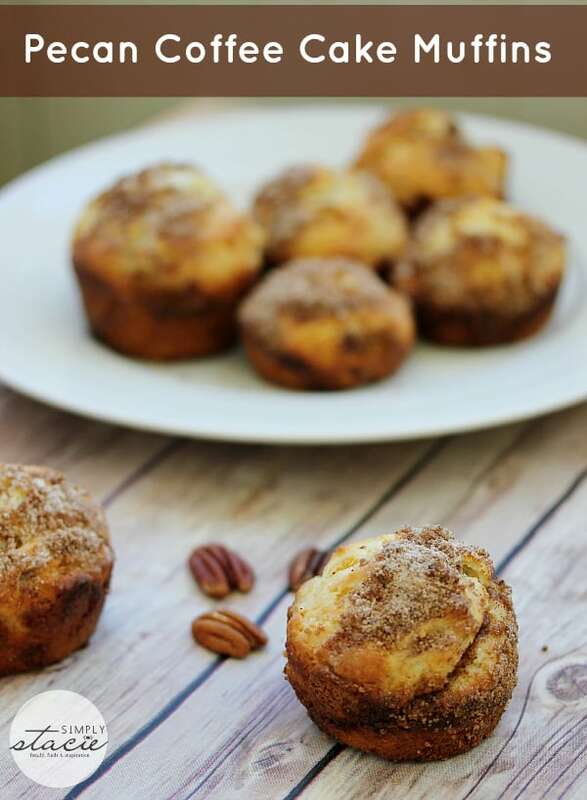 However, this week the Friday Recipe Club is featuring pecan recipes to gear up for the upcoming food holidays. 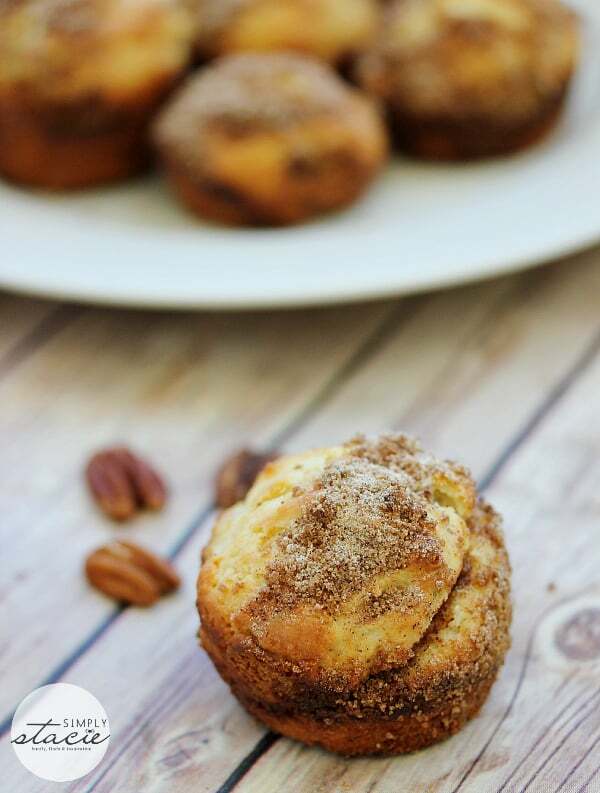 These Pecan Coffee Cake Muffins easy to make and perfect to eat when you are craving a sweet treat. For more pecan recipes, check out these recipes for Maple Pecan Porridge, Pecan Chocolate Banana Bites, Chocolate Pecan Tarts, Easy Butter Tarts, Chocolate Pecan Turtle, Chocolate Jam Pecan Bars, Sinfully Good Southern Pecan Pie and Pecan Haystacks. You might also like this delicious coffee cake just like grandma used to make. Easy to make and perfect to eat when you are craving a sweet treat. Preheat oven to 400°F. In a large bowl, stir together flour, baking powder and salt. Make a well in the centre. In a large mixing bowl, combine the butter, sugar and egg and beat on medium speed until blended. Add in the milk and vanilla and beat on medium until blended together. Pour wet mixture into the well of the dry mixture. Add in pecans. Stir until just moistened. To make spice mix, mix ingredients together in a bowl. 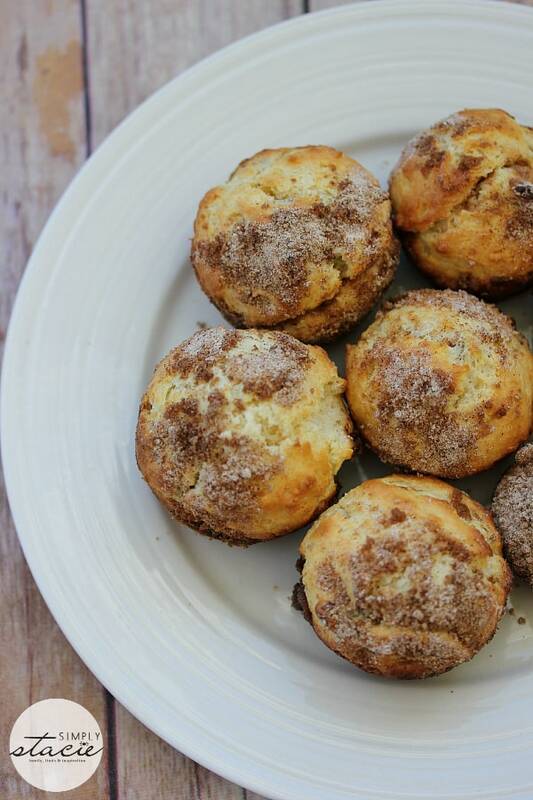 Grease a muffin pan and add about a tsp of the batter to each muffin cup. Sprinkle a little of the spice mix on top. Then spoon the rest of the batter evenly over top of the muffins and top with the remainder of the spice mix. Bake for 20 minutes or until a toothpick comes out clean from the centre of a muffin. Oh these look wonderful!!! I think I am going to try them tomorrow!